Are you wondering what are the applications of laser die cutting machine? Laser die cutting machine systems have numerous applications like shaping, creating, and cutting metals. With the help of molds and templates, die is tailored keeping in mind the final object. There are plenty of conventional laser die cutters including flatbed, press, and rotary die cutters. With the advancement in technology, laser die cutters have gained popularity. In this write-up, we have talked about laser die cutter in detail. Read on to know more about the laser die cutting machine applications. What is laser die cutting for laser die cutting machine? Laser die cutting is a process of cutting materials into different shapes and sizes. This technique uses a non-thermal focused laser beam that cuts through the substrate. The laser is generally, computer controlled that follows the pre-set design. It is an easy way to produce mass uniform products. This is useful for manufacturers as it can speed up the process and improve accuracy. The laser die cutting is helping in shaping tough materials together that are hard to manage. The process of laser die cutting is very simple and fully automatic. The first thing you should do is design the graphic you want to print and import it to the laser die cutting machine software. After that, you must choose the laser power, processing quantity, speed, and start the machine. Once the printing is complete, the material laser die cutting will take place. When all the work is complete the laser die cutting machine will stop and you can get your labels. Laser die cutting machine can replace the conventional methods of cutting. 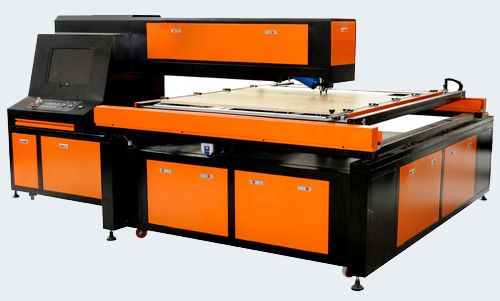 Laser die cutting machine system can perform various tasks. The single cutting can laminate and remove the scrap papers. The laminate films improve the durability of the labels by protecting the surface. Moreover, it increases the luster level. The final labels can be produced by removing scrap papers. When cutting labels, crucial information like barcodes or date and time can be marked on the labels simultaneously. It is challenging to cut reflective materials using knife die cutter. The cutting process is costive and slow that causes damage to the knife. On the other hand, laser die cutting is great for reflective film cutting as it is a process of non-contact heating. This enables you to cut out whatever shape and design you like. It is a great way to enhance the value of your product. In the end, with laser die cutting machine, you provide customers a chance to get precise and accurate labels. The laser die cutting is a technique that offers high speed, intelligent production, and convenience. It is the laser die cutting technology that gives you the cutting edge advantage in the production process.